Say hello to 'the dude' in this amazing The Big Lebowski Framed Print! 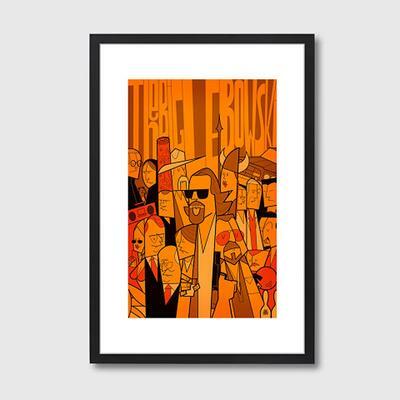 This cool tribute print is made by Ale Giorgini and shows off the cast and crew swathed in a vibrant orange shade. Of course, you'll find the Dude front and centre with matching shades. The print is placed under white matting and covered in shatterproof Perspex glass. Then it's topped with a wooden black frame to give it a sleek, modern look. Hang this in your living room wall and show it off. Or better yet, give this as a present to someone who really loves the film. It will make them really happy. Also check out the other framed prints from this collection. We have them here at the shop.